In additioned to the stuff mentioned in the big letters above, Mighty is Creative Director of the Performance Company which means that when the girls come up with another one of their wacky ideas, they tell him to make it happen. Clearly outnumbered, Mighty does his best to do as they say which usually includes mixing music, creating choreography, editing videos, writing scripts, fetching lattes, watching purses and heavy lifting. 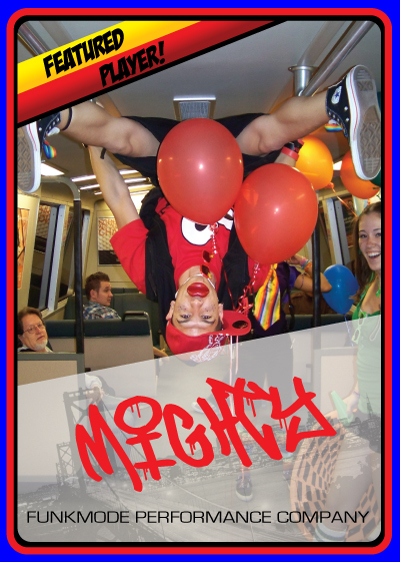 Mighty's dance and performance experience goes all the way back to his childhood which you can learn more about by clicking on the link below. He uses this experience on a daily basis as he works full-time with FUNKMODE producing, directing, teaching and performing. His ultimate goal is to use technology and the interweb to take FUNKMODE worldwide. 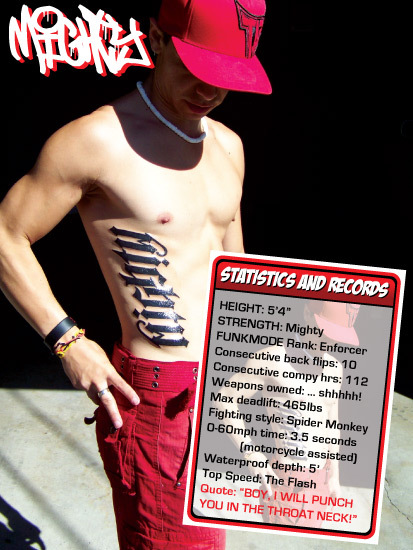 Mighty is famous for spending countless hours on the computer, wrestling bears, mastering the one-second shoe tie, making sweet love to his Playstation, reading comics and hawking FUNKMODE merchandise to Girl Scouts in exchange for cookies (mmm ... tagalongs).